Every child wants to be successful. As a parent, you obviously want your child to have fun and succeed in youth sports. A barrier to this outcome, however, is that most participation-based youth sports programs (and many neighborhood games) are comprised of children with unequal levels of ability. Whether these differences are based on talent, experience, age, or body type, they generate moments of failure for many kids. Overmatched beginners, players having less athletic ability, and teams missing key components, will all struggle to compete. In a purely win-loss scenario, there are lots of losers in youth sports. Good instruction and organized programs well-matched to your child’s current skill level can of course provide your child with a better opportunity to enjoy success. But even as your child progresses down a normal development path, he or she will likely face many difficult moments. So when your child is frustrated, disappointed, or otherwise struggling, how can you and your child’s coach help? Social psychologists refer to “framing” as a process of understanding and explaining events relative to the context (circumstances) in which they occur. As a parent you ideally see the bigger picture—the changing nature of your child’s participation in sports throughout his or her developmental years. But a struggling child is unlikely to see past the reality of his or her current shortcomings. He or she doesn’t see personal differences and flaws as “having character.” And the future is distant to a child who is picked last, made fun of by other children, or feels unable to compete. It’s not surprising that many of these children develop a negative view of playing sports. Through the use of framing, however, you and your child’s coaches can help bring a more balanced perspective to your child’s view of his or her youth sports experience. If your child’s coaches are good teachers, they will provide both essential instruction and a positive, supportive learning environment. 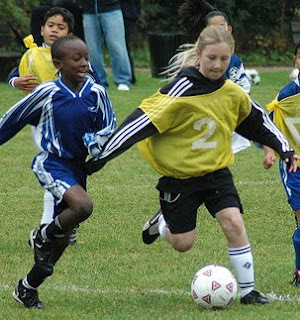 To create this positive setting for beginners and lesser players, they will commonly frame each player’s performance relative to other children of similar age and ability. With a chance to contend, each of these children will naturally begin to enjoy competing, giving his or her best effort, and striving to become better. Where possible, a good coach breaks down contests into smaller ones, finding opportunities for each player to succeed. These “contests within a contest” enable a coach to frame the competition in a way that benefits every player. For example, during a basketball practice, a coach might have his players run a “Suicide” race where each player progressively touches lines further down the court, always returning to the starting baseline. There are always one or two children who will win the race and likewise lose it. Although this drill may help get kids in shape, promote team bonding, and appeal to the fastest ones, it’s not inherently fun for the slower ones. But by shouting words of encouragement to the slower players, giving attention, and framing the race as one against another player of similar body type and ability, the coach can motivate these players to give their best effort. Although they lose the overall race, they begin to enjoy competing. They see the connection between effort and reward—and they strive to win. In addition to framing competitive situations, a good coach will also frame a player’s team role. For beginners, the coach will emphasize to both the player and team how even minor contributions (e.g., setting a screen in basketball that leads to a layup) are important to the team’s success. For older, more talented children, the coach can frame the player’s role not only as it relates to obvious contributions (scoring), but also to the less apparent ones (leadership, making teammates better). But if a coach does not positively frame your child’s participation and team role, then you will need to do so. Cast your child’s participation and contributions in the proper light. You can easily frame the child’s mastery of a skill relative to their age, experience, talent, or past performance to provide a relative sense of positive progress and success. Explain how differences in age or experience (relative to other players) may make it more difficult to excel now. Try to show your child how a certain physical limitation (e.g., small in stature) can often translate into a positive attribute (e.g., quick, and strong). And always remind your child that his or her physical body is constantly changing and that this change can lead to new opportunities. Emphasize how small contributions can make a huge difference in a close game. A child who has an understanding of his or her capabilities, and grasps the concept of playing a team role, will always find acceptance within that sport’s community of players. Even with limited physical talent, these children can enjoy the benefits of playing sports—and do so well into their adult years. Finally, framing an experience does not necessarily mean sugar-coating events, setting low standards, or making excuses for poor behavior. You choose the extent to which you want to hold your child accountable. There may be instances where you believe your child should perform at a higher level. In these cases, you can frame your child’s performance against some higher standard. For example, a talented, confident child may score many goals (possibly against a weak opponent) and believe that he or she has played well. But the flip side is that he or she may also have played poor defense, giving up a number of goals. You may choose to remind your child of this fact to adjust his or her view to one that you believe is more appropriate. Whenever you believe your child’s perspective is limited or distorted, you can help your child by framing the underlying issues in a more appropriate, balanced way. Thanks- this is just what I needed to read today. It's so easy to lose perspective when your kid is struggling.